How is everyone doing today? 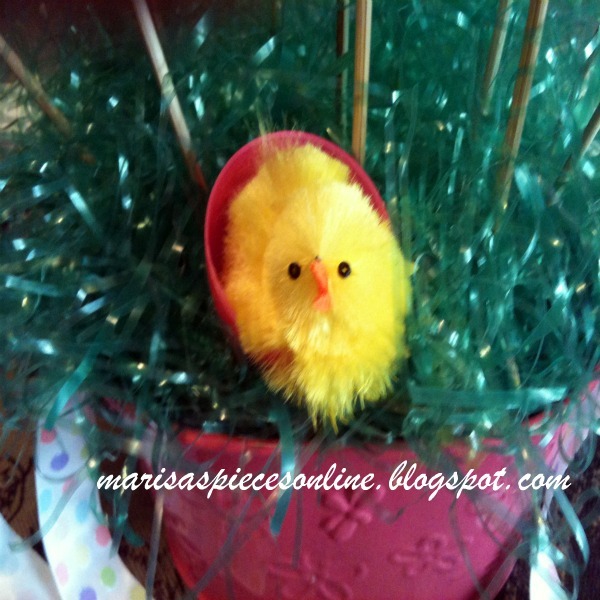 It is 81 degrees today here in Alabama so I thought I would get out some of my Easter decor. I made this last year and I believe everything came from the Dollar store. I glued the eggs together so they wouldn't come apart and there is a small hole on the bottom of each egg and I glued the skewer into the hole. I tied some ribbon on each handle and look..... a cute little chick. 81 degrees?! I need to move to Alabama, we don't hit 81 until at least July in Utah! This is so darling, I especially love the little chick, so cute! Awwww.... the chick is so lively and cute! Good job dear! Cute! It was 85 here in FL! Thanks for linking up at SweetTalkin' Sunday! Thanks for linking up last week! You were one of the featured posts! I linked up with your post on Facebook and Pinterest. I would love to see you join us this week again! :-) This weeks linky party is now active. I like it!!! Marion, from the blog Criações em família & cia. Really cute Easter bouquet. Thanks for sharing at Bacon Time.